Words of warning, this will be one of the dense-r posts (read substantial + helpful). I try to inject lightness in my writing – who says being healthy shouldn’t be fun? – but there are subjects that are a bit of a must if I am to share my love and passion for Ayurveda. So this is chapter 2 on the doshas and I’ll try and make it shorter and sweeter than the last. We’re looking at the Pitta body-mind type. Click here to take the test and find out what your body-mind type is (or are, if you have more than one predominant dosha). The energy of Pitta creates heat and controls metabolism. In the body it is a biological combination of fire and water. The qualities that make pitta are hot, sharp, light, liquid, spreading, oily, and sour. In my previous post Know Your A, B, C’s you learnt that if you have a strong Pitta dosha then you are of medium physique, strong and well-built. You have fair or pink reddish skin sometimes with freckles, fair or red hair. You become uncomfortable in too much heat or sun and will burn. Physical concerns you might meet include rashes, inflammation, acne, acidity in the stomach, loose stools, heart burns, ulcers and problems with your eyesight. You have strong digestion and appetite and would feel ravenous if you had to miss a meal. At your best you have a sharp, keen intellect. You enjoy challenges, you are passionate, competitive and entrepreneurial, assertive, self-confident, precise and articulate, orderly and focused. When out of balance you can be critical and have a quick temper, you get easily frustrated and angry. Watch out for signs of becoming a workaholic and losing your work-life balance. Under stress your first reaction is irritation. You are a born leader with good public speaking skills but must keep your tantrums in check. As always keep in mind that these are tendencies and no one fits exactly into the description. Doshas influence your body and mind but you are made up of all three doshas in different proportions and with a specific and unique make-up: yours. If you feel yourself getting aggravated, too intense and into pitta overload here are some tips for self-soothing before you burn out. Choose calming & cooling foods, not cold or icy but foods that cool your temperament from the inside out. The best way to do this is to focus on the sweet, bitter and astringent tastes in your meals. Examples are mung beans, coconut, coriander, asparagus, sweet fruits and salads. I also recommend milk, butter and ghee (clarified butter used in Ayurveda with very potent qualities and a cooling digestive effect), all sweeteners (in the healthy range preferably!) but not honey which is heating and will add fire to your already overheated body functions. Stock your kitchen with rice, oats, lentils, granola or muesli and tofu as a few key ingredients. Pomegranate is a saviour too, drink it as a juice or add the peeps to salads and other dishes. Eat your greens. Sprinkle cooling herbs such as mint or dill. On the other hand avoid sour, oily and spicy hot foods. Your meals should basically be quite simple in taste. Alcohol is not advised if you’re aggravated, neither are caffeinated drinks, tobacco or meat. Try and eat vegetable proteins. Pittas are very sensitive to impurities so take in only pure foods, use clean cosmetics or none at all, make sure your environment is as chemical-free as possible or metabolic imbalances will appear. Find a healthy channel to release suppressed emotions such as anger or irritation. Meditation and yoga are again your best tools. Or start a team sport where being “one-of-the-team” is more important than a solo win – or where playing is more important than the competition. Watch funny films on repeat, lift your moods up with a comedy. Laughing is your best medicine, you need to lighten up and share a giggle with someone you love. Your nature is joyous when balanced so you just need to come back to that happy, sweet place. Pittas have a thing for beauty: a beautiful natural scenery will soothe your senses – or if in the city go to an art gallery and make your living quarters as harmonious looking as possible. Walk by a lake, river or the sea. 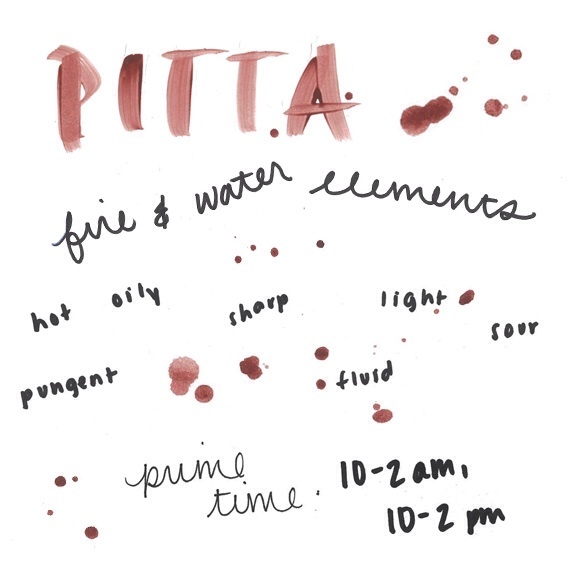 The water element is part of pitta but in its natural form it will cool your fiery nature. Walking on a (safe) moonlit night is meant to be very cooling if you would like to try it. Avoid staying in the sun for too long is a given. Saunas and steam rooms are best avoided too. Coolness in any form will help. A brilliant tool for overactive Pittas is the Sitali breathe. In very simple words it consists of breathing in with your mouth open around your tongue which should be curled on the side as if forming a tube. You should extend your tongue slightly out if you can and then exhale through the nose, this for 3 to 5 rounds. If you’re not able to curl your tongue, the Sitkari breathe provides the same benefits: breathe in through a slightly open mouth as if hissing, your tongue resting behind your lower teeth and breathe out with your nose. Your in-breath should basically feel refreshing. Did I say yet? Cool, cool, cool. And without needing to go all hippie if that’s not your call, cultivate a little kindness and acceptance. You can do it! Yes , it’s good explanation about AYURVEDA even though as foreigner , about the Indian System of Medicine ie Ayurvedic Medicine you have explained in good manner. BAMS; MD(Ay);PhD.,Ex Principle Ayurveda College&Hospital, TIRUPATI, INDIA.